iLike Video Converter transforms between AVI, MPEG, WMV, DivX, AVCHD, MKV, RM, MOV, XviD, 3GP, MP4, H.264/AVC videos, transform between MP3, WMA, WAV, RA, M4A, AAC, AC3, OGG audios. 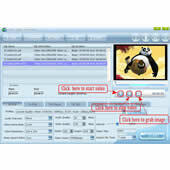 The deeply optimized codec provided by this video converter makes it possible to watch movies and listen to music on iPod, iPhone, iPad, PSP, PS3, Apple TV, PDA, Zune and other digital devices. The transform speed is very fast. It also has built-in parameters for major output devices, includes: PSP, iPod, iPhone, 3GP, PDA, Zune, users do not need to acquire specialized knowledge before using it.